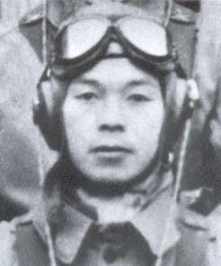 On June 22, 1945, Second Lieutenant Shiori Harada took off from Miyakonojō East Airfield as a member of the 27th Shinbu Special Attack Squadron and died in a special (suicide) attack west of Okinawa at the age of 26. He piloted an Army Hayate Type 4 Fighter (Allied code name of Frank). After his death in a special attack, he received a promotion to Captain. He was from Kumamoto Prefecture, attended Waseda University in Tōkyō, and was a member of the 1st Class of the Army Special Cadet Officer Pilot Training (Tokubetsu Sōjū Minarai Shikan) Program. Someone said when you leave and when you withdraw are most important. I was born in the Empire and live in hell for the Emperor. It is like paradise. My body of a mere five feet will rest in a 50,000-ton coffin . Why will it get something not eternal? With my little strength, if I become one piece of Jintan candy mint that will be used in the best way forever for the Emperor and country, I wonder if there is anything that will surpass this drugstore glory. The persons who go are relaxed like the wind. However, as for the emotions of those who remain behind, there are lamentations for the dead birds. The emotions are tears, and love is painful. However, loyalty is even more supreme. Long live His Majesty the Emperor. My country. All the best forever. All the best. All the best. The letter and poems come from Muranaga (1989, 72-3). The biographical information in the first paragraph comes from Muranaga (1989, 72), Chiran Tokkō Irei Kenshō Kai (2005, 213), and Osuo (2005, 196). The image of the above poem comes from Chiran Tokkō Irei Kenshō Kai (2005, 150). 1. The weight of a fully-loaded Essex-class aircraft carrier in WWII was nearly 40,000 tons. Muranaga, Kaoru, ed. 1989. Chiran tokubetsu kōgekitai (Chiran special attack forces). Kagoshima City: Japlan.